Alza's Film Clive Houston, We Have A Problem Winner of Nevada Film Festival Best Foreign film, is in negotiation with distributors. 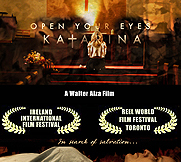 After last year’s ReelWorld hit “Pay in Full”, Reel world thought it would be interesting to pair a couple of Walter’s featurettes: “Clive Houston, We Have a Problem” and “Open Your Eyes Katarina”. They are a pair of 20-minute short films that show a genuine contrast in his directorial esthetic. "Pay In Full" written, directed and produced by Alza, gets Canadian Television Distributions and it is a hit a Reelworld.ca Film Festival, with a sold out screening. NEWS: The Alza Award Winner of 2014 will be announced on Feb 4th! Margarita Soldatova‎ Walter Alza Acting Studio · · Walter Alza thank you thank you thank you!!!! I landed a lead part in a film!!!! I'm so overjoyed right now!!! Thank you!!!!!! Laura Sniderman Walter- thank you for your wisdom tonight at the seminar. I returned home to an email informing me I have landed another lead role in a short film!! "aim high, and pay no mind"
Agata Waclawska Too all my wonderful classmates and Walter Alza, thank you so much for being so talented and inspirational! Even though this session isn't complete yet, I have to admit that I have learned quite alot so far. I would also like to announce that I have booked two short films with lead roles this past week! I'm incredibly proud and grateful for all of you! Laura Sniderman · Edited I just wanted to give a big thank you to Walter, Tim, Dean and family. I just joined this beautiful film world a month and a half ago and I recently booked two main roles- one for a short film and another for a television pilot. I have learned so much over the past 7 weeks! Jennifer Louise Very excited to announce that I landed one of the lead roles in a show series! Thank you Walter Alza and fam!! Jose Aloma · Toronto Just landed the lead role in a short film!! Super excited!!! Words can't express the gratitude I feel!! Wouldn't have been able to do it without all the amazing people at the studio, and Mr. Walter Alza !!! Margarita Soldatova · Maple Just found out today that I landed a role in a feature film. Thank you Walter Alza and team!!!! Winner of best actor at Cannes Film festival, RJ Parrish - Congrasts! 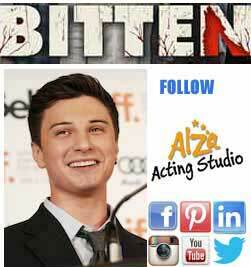 Hollywood Reporter Announces our student Alex Ozerov starring on one of his new feature films this summer 2014 "Natasha". Hard and smart work pays off! Walter Alza about to embark in a few new projects. 2014 is looking bright for Mississauga Trailblazer and multiple time Award winning actor/producer/director and writer Walter Alza (Get Rich or Die Tryin’ Metropia). Walter has been nominated for two Marty Awards for his work and the results will be out this Thursday May 8th at 7pm at the Living art center, you are invited. Come and walk the red carpet with Walter. Back on the big screen; You can catch him in the feature film “He Never Died” Starring Henry Rollins. And Co Starring in the feature film Blood Empires, a dark police drama about the complexities of family, friendship, loyalty and love. Walter plays a detective Guzman alongside some of Canada’s finest actors. 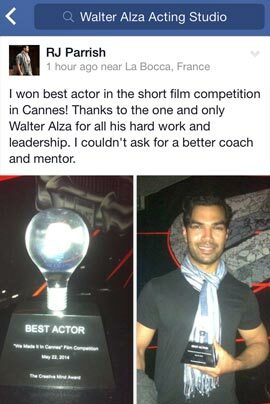 "I'm so grateful to have Walter Alza as my acting coach." https://www.facebook.com/ksenija.ikonic?fref=nf Ksenija Ikonic Just landed a role in a music video, filming this week! Thank you to Walter and the studio for the endless support and encouragement. Jessica Siegner, I want to say a HUGE thank you to Walter Alza for his incredible coaching and pushing me out of my comfort zone every week in class and privates. Because of this man I have grown so much during my time at the studio and I am incredibly lucky to have him as a coach! Thank you Walter and everyone at the studio!! Feeling blessed! Here's a look at the trailer for The Hotel Dieu Movie which I filmed last summer! Chris Gonsalves Just landed a lead role in a short film using many of Walter and Dean's character analysis drills, thanks for your time and knowledge guys! Lauren Roberts Dear Walter Alza thank you so much for all the valuable tools you give me, i just landed another Lead!! I have never worked so much before. You stand alone, you cant becompared to anyone. Thank you, you are the man. Laura Pimm Just landed a lead in a short film. Thank you Walter and Dean for all the amazing coaching! Brandon Macpherson I just finished work on my tenth short film since training at the studio. Thanks for everything Walter, Dean and Tim! Jose Alomar I officially have an agent! Thank you Walter for everything you've taught me and the things you will continue to teach to help me become the crafted actor I hope to be! Lisa Solberg Hey Walter Alza I got my first role, as a lead in a music video. It was an amazing experience, something I could have never done without all your guidance, encouragement and belief in me. I used so much of what you have taught me in both class and in privates. Thank you so much for everything! I am looking forward to learning more from you in 2014! Thank you! Trevor John Thomas A BIG thank you to Walter Alza for the VERY informative and inspiring ShowBusiness Seminar tonight!! What a treat to have his many years of experience in the industry open for our discussion. He says that sometimes this business can be cut-throat but here is to the man who goes against that stereo-type. Muchas Gracias !! Pedro Abrantes I got the lead actor on a portuguese short-film 2 weeks ago, and today I have got a part on a portuguese feature film. I can't express how grateful I am for everything that you taught me. I want go back to the studio and improve my craft. Thank you for everything Sir. "Walter Alza is passionate - an inspiration to all actors." - Natalie Rezneck (take the lead, So You think you can dance finalist). I knew from the moment that I found Walter's website he was going to be able to help me achieve my dream of becoming an actor, I wasn't wrong. I have learned so much with Walter in the last 6 months that I don't think I would have learned with anyone else. I feel so grateful that I have Walter as my acting coach and I know I will be able to make it far. Jose A. (15 years old).
" It is helping me a lot to go deeper into layering characters to have a forum to get feed back, see other actors work, and benefit from Walter and Tim's knowledge and ability to develop actors in their craft" - Lucy D.
Walter Alza is very passionate about his craft. He eats , breathes, lives for his craft and that is what he wants from those who he teaches. Its never easy opening yourself up but with his guidance you will become more secure with the tools you learn from him. Matthew M.
" It's been great! I've been in other places but this is it, this place meets my needs and my wants as an actor, it's challenging and fun, it's a great place to work and working with Walter Alza really gives me the sensation of being in the industry, it's great to be able to work with some one that is out there in the industry and has that much experience "- Pedro R.
" Walter's class is an exposer into all the fine ingredients that go into remarkable acting. He has acute insight into character motivation. The tempo + rhythm of dialogue the variance of creating emotion through motion" Jennifer L.
" This is a very engaging class. Walter Alza works very patiently with every individual and constantly encourages them to develop their craft . Fun class for people of all ages, backgrounds & skill levels " - Karina R.
" Im grateful for Walter's studio. I look forward to working more. You learn to love the craft, because all the lessons you learn from this studio apply to anything and everything in life" - Brian W.
" Walter Alza allowed me to get in touch with my inner emotions and taught me to sharpen my focus which helped me portray my emotions easier, and helped my performance to be more realistic" - AnthonyK.
" Walter is truly a pleasure to work with. His knowledge and experience in the profession makes him an excellent teacher ans mentor. I have learned so much in one session and I can't wait to learn more! ".Laura K.
" I really enjoyed the class. I learned a lot from this class and I am looking forward to coming back and getting some more experience" - Rashad W.
"Training at the Walter Alza Acting Studio has changed my approach to acting in the best way possible. Alza's dedication to his craft and extensive knowledge about the performing arts has helped me improve my skills in infinite ways. If you want to learn from the best, this is the place to be!"Jordie . Before i started working with Walter, I had never acted out a scene in my life. In the few months I have taken lessons, Walter has helped me realize my potential of acting through his enjoyable and interactive style of teaching". Marco S.
Waiter is a person who expects people like us to do well. He tell us what he wants and when he acts you see the passion and the beastly form that is unleashed, this is what he wants form us teh intensity, passion, etc. He is also, calm, cool, and kind he talks to you if you need help. Sydney D.
The above quote exemplifies that it is vital to finding one’s expression as an artist. Many actors fall hostage in emulating their favourite artists’ causing the actor to fail in finding his or her own unique method. At The Alza Acting Studio, not only is it advocated to find one’s own artistic voice, but one is also taught to excel in it as well. Walter Alza nurtures and encourages his students with every fiber of his being to accomplish artistic excellence and recognize the potential that he sees in us. He has taught us to reach deeper from the inside in order to develop an unfailing technique that directly transcribes into working on TV or film. Walter’s teaching skills are exceptional and I always look forward to each and every session with him. Without a word of exaggeration, I leave each session feeling more prepared for the film industry than when I arrived. Yelrihs C.
I have been extremley lucky to have been accepted into walters fine studio. Walter is the coach & person I have been searching for eversince I joined this industry. I have learned so much not only about acting but myself! when working with walter he brings out the true actor in you & helps access areas within yourself that you never knew exsisted & could be shared. Walter is the only person that has been able to bring out my best performances & I suggest that actors who want to work should work with him ! Walter is the man! Jesica R.
The craft class is absolutely wonderful. It is at the same time challenging which it great. It will take you places that you forgotten or might have buried deep down inside yourself. But once you let it out, it feels like the best achievement in the world. It is so inspiring, makes you want to play, go out there. Alex Ozerov. The craft class has helped me be aware of my surroundings and my feeling. Learned to give in to trust, to be in touch and to be in contact within me. Lil. The craft class has opened my eyes to a person I'd never would of known I could be. It opened me up to another me, someone I know I can always be. Cesare. "So far this experience is so much fun in this craft class, it built me lots of confidence as an actress and it helps also in my daily life. Walter I love this class." Ana Ivina Raman. Working with Dean was a great experience. He opened my eyes to a new way of learning though a directors perspective. The detail he made us learn about our characters was amazing making us relate to them as much as possible. one way was making vivid stories(memories) of the character ethier past present of future about the scene we were dealing with,making it as if those memories(stories) was really happening at that moment. as well the different methods of trying our lines to see which one worked the best with the scene by trying different ranges high voice or low voice or a mix of both, different attitudes to bring to the scene as well happy, sad, etc. these techniques helped you really get into the scene, this was a great way of learning. I am really grateful i got to experience the great class with dean he's a wonderful teacher. Mattia I. The class was great.it wasn't what I expected but more. Walter really helps everyone individually and makes sure thesy understand and get it right. I loved it Kayla B. The class was really good, new real experience and what not. Extremely emotional it was exiticing, really enjoyed it. Noura B. The class was great i had alot of fun and clearly noticed how passionate of a teacher/actor walter is. I also really liked the small class. looking forward to the next three weeks! Monika B. "I was very lucky to be accepted at this studio at the age of 15. I'm 18 now, and i think the most important thing I've learned is that is it a craft, it takes patience, and the time it deserves to be put into it on regular basis. In these classes you don't just learn how to act, you learn how to be a pro; how to deal with direction, relationship with the camera, nerves, and doing proper preparation on the script you are given, and adding those little details that aren't seen on the page. Going to the studio for 3 years have made me actually know what I'm doing at the audition and on set! Even if this is a hobby for you, its an opportunity to understand yourself better as a person, go back to those places that yo have berried away for so many years, and can really be a cleansing process. Now as an artist, do you want to be good or memorable? Your choice! Through out the years, i think I'm just starting to understand the information that is being presented to me, and the journey of an actor never ends! With these tools I've been able to land 5 gigs in the last 3 weeks, one of which being big feature! Walter is a unique and wonderful acting instructor. I have been working with him in class and in privates, and he has helped me considerably with my confidence in scenes. Walter knows what to say to get me to a certain state fast, and how to get me to keep that state so I can immerse myself in the scene and become the character. He teaches you how to look at a script in a different way, to find the background of a character in a deeper sense. His on camera classes are excellent! I have learned so much and continue to learn from him and grow as an actor. Thank you Walter. Shawna Button. If you would like to stay on the loop and received our newsletters from Alza 44films LTD. and our partner company Alza Acting Studio, do let us know. A wise man once said that "acting is behaving truthfully under imaginary circumstances." Here's the truth: today's Alza will help you develop your character, and learn how to make other people notice it. Choose one of the following classes from Walter Alza Acting Studio: No audition is required to take the Introduction to Acting on Camera and Alza's Tools (Method) class - and now very little cash is required, too. This class is designed for the greenhorns out there who've got no or next-to-no formal acting training and focuses primarily on scene study. Aspiring Meryl Streeps learn to break down scenes and monologues from theatre, film and television; to be present; to work out objectives and actions and to make strong choices. After four weeks' worth of three-hour classes, students begin to understand the meaning, purpose and application of tempo/rhythm, as well as how to train the body for line movement in long, medium and close-up shots. The instructors don't leave you hanging on the audition front, either: they give you tips and techniques for improvisation, cold reads and everything in between. © Alza Acting Studio. All rights reserved.